Question: What distinguishes the modern Democrat Party From the Republican Party? Answer: Democrats have a cohesive ideology and the Republican Party has none. And there lies the basic difference. Today, whether they admit it or not, Democrats are driven by Marxist ideology. And it is from that ideology their policies and programs are born. Ask yourself, what do Republicans stand for? And you get a multitude of vague and incoherent answers. The definition of Marxism is the theory of Karl Marx which says that society’s classes are the cause of struggle and that society should have no classes. An example of Marxism is replacing private ownership with co-operative ownership. So, I think, Most Jews in America are members of the middle class or above and are also members of the Democratic Party. Why would they want to be part of a failed political ideology that destroys society? And then I expand, And Carl Marx was a JINO (Jew In Name Only)!? And then I expand further. I thought about Korach, a Jew who did not reject his Jewish roots, only wanted to be more of the elite or else! Why Korach? Because I was thinking roots, Judaism and Marxism all in one. Korach was no ordinary rabble-rouser. He was a leading member of the Kehatites, the most prestigious of the Levite families. Joining him in his mutiny against Moses and Moses’ brother the High Priest Aaron, were “two hundred and fifty men of Israel, leaders of the community, of those regularly called to assembly, men of renown.” Korach’s difference with Moses was an ideological one, driven by the way in which he understood Israel’s relationship with G-d and by the manner in which he felt the nation ought to be structured. 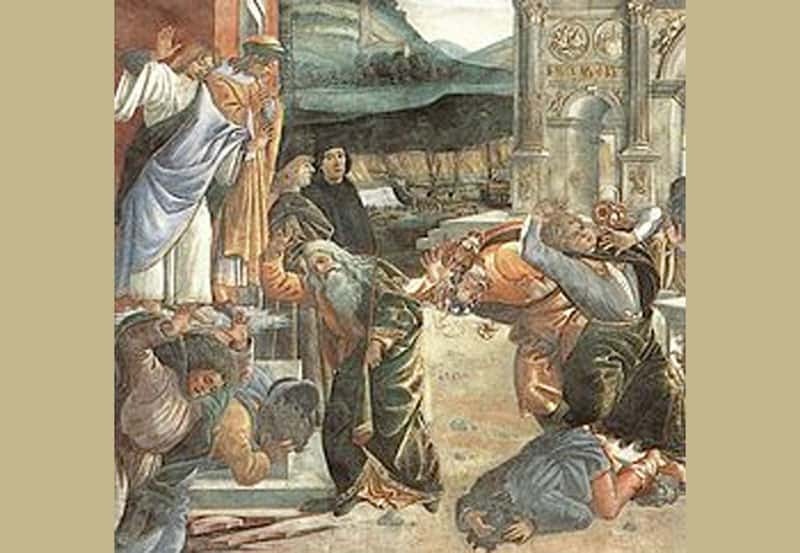 Korach’s punishment by Sandro Botticelli. Obviously, there is something at the heart of Korach’s contentions that is the essence of all disunity. What Moses did, he had divided the people of Israel into several classes of holiness: “ordinary” Israelites, Levites, Kohanim (“priests”) and, at the pinnacle of this pyramid, the Kohen Gadol (“High Priest”). The Israelites – the farmers, merchants, craftsmen, soldiers and statesmen of Israel – were to pursue the “normal” existence of physical man – a life and vocation that involve the bulk of a person’s time and talents in the material world. The tribe of Levi, however, was “distinguished by the G-d of Israel from the community of Israel, to be brought closer to Him,” to serve as spiritual leaders and priests, “instructing Your laws to Jacob and Your Torah to Israel; placing incense in Your nostrils and burnt offerings upon Your altar” (Numbers 16:9; Deuteronomy 33:10). Within the tribe of Levi itself, Aaron and his descendants were consecrated as “Kohanim” and entrusted with the primary role in serving G-d in the Sanctuary of the Temple. Aaron himself was appointed Kohen Gadol, “the greatest of his brethren” in this hierarchy of holiness. Korach seems to be objecting to this spiritual elitism. But from Moses’ response, “Is it not enough for you that the G-d of Israel has distinguished you from the community of Israel … that you also desire the priesthood?,” we see that Korach actually desired the office of the Kohen Gadol for himself! Roots did not mean the same then, that it means now. Korach was born a Jew, but sought to take from Moses that which G-d gave to Moses, the leadership of the Jewish people. That is the template on which all anti-Jewishness and anti-Jews build their new edifice. Karl Marx rejected G-d, the G-d of the Jews. He did so in order to claim power over others. Power is what drives these anti-Jewishness Jews. As a non-orthodox Jew, I believe that we, Jews, are a special people. If you are a believer in G-d, then you are destined by G-d to be a model for all; if you are not a believer in G-d but are a believer in the Jewish people, you believe we, Jews, are destined by history and our unique gift of moral behavior is to be a model for all others. I found that credence while I may not get the whole G-d ‘thing.’ More so, I support the more orthodox side of the Jewish people because it is the real “Chicken Soup.” It is not some Korach-like interpretation of what the Torah says. It appears that anti-Jews/Jewishness, who were born Jewish, suffer from the same deficit, a need to have power over others. And that includes many Rabbis, throughout our long Jewish history. Not those of great Rabbinic minds, but those lesser ones who sought to lead our people astray from the principles of Torah by fogging it in terms never intended by Torah, like Social Justice and repair of the Universe. Anyone who wants to claim power over others, the first thing they do, they reject religion, i.e. Communism, Nazism. Power is what drives many, not necessary anti-Jewish Jews, i.e. all type of dictators, presidents and prime ministers, congregation leaders, community organizers. True, real Jews are destined by G-d to be a model for all. However, many in the Jewish tribe do not have the faintest idea what it means to be Jewish and the meaning of Jewishness. Leftism, which is the new religion of many Jews, means having power over others. Their way or the freeway, no discussion. And that is exactly the point. We, Jews, through our Torah, provided the historical archetype for all Jews and non-Jews who seek power over others. We are also provided, through our Torah, the historical archetype for those who are models for others to follow. Moses was a humble man and he did not seek nor ask to be the leader. Of course leading a tribal society is not the same as leading a nation. But in both cases, the tribal society and the modern technological society, as we know it to be today, there are those who seek power over others as an end in itself. Those, their roots are with Korach, not with Moses. Our Jewish history has been plagued with the decedents of Korach and others like him who rejected their Jewish roots and seek the original Korach roots.